Lieutenant Colonel Fermin Carangan is the Commanding Officer of TOG 8, the Air Force unit tasked to provide air support for the islands of Samar and Leyte. On the morning of Friday, November 8, he and his troops were in their office near the Tacloban Airport on red alert, having been informed of an incoming Super-Storm named Haiyan (local name: Yolanda). Here’s how he narrated his ordeal to Lt Col Allan Taguba, as Haiyan unleashed her fury on the city of Tacloban on that fateful Friday morning. We were out of the office at 6 am Friday observing. 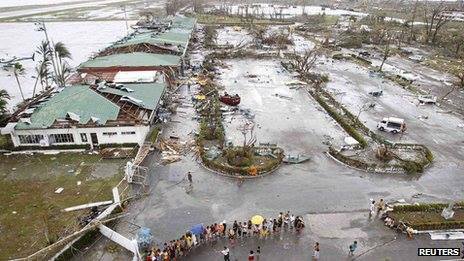 Winds brought by Yolanda were already strong around that time. We (the Air Force troops in Tacloban) were prepared for the possibility of rescue missions days before the expected landfall of Yolanda. Just before 7 am, the rains started to pour, so we took shelter. Thank you – it does make it much more personal.